Properties in Historic Seaport average 4.7 out of 5 stars. Historic house w/ private pool & easy beach access - ideal for groups! Dogs OK! Property 4: Historic house w/ private pool & easy beach access - ideal for groups! Dogs OK! Property 9: STARFISH - SUNNY TOWNHOME in QUIET TRUMAN ANNEX TWO BLOCKS FROM DUVAL ST.
"DANCING PALMS" ~ Truman Annex, Covered Parking Spot, Gas Grill, & Hot Tub! Property 10: "DANCING PALMS" ~ Truman Annex, Covered Parking Spot, Gas Grill, & Hot Tub! 2 Blks to Duval, 2/2 1/2 luxury property, free wifi, pool, courtyard, low rates. Property 15: 2 Blks to Duval, 2/2 1/2 luxury property, free wifi, pool, courtyard, low rates. Property 23: Welcoming home w/ shared pool boasts great Old Town location - dogs welcome! "BELLA VITA" ~2/1.5 located in the Truman Annex with a community pool! Property 37: "BELLA VITA" ~2/1.5 located in the Truman Annex with a community pool! Property 41: "SEAS THE DAY"~ Newly Built Townhome in Perfect Location with Community Pool! 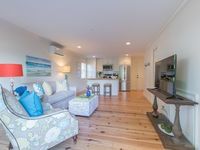 Property 43: "COCONUT PALM" ~ Old Town Hidden Gem Located in the Midst of the Action!